Expression of candidate early glomerular epithelial/PEC genes correlates with chronic kidney disease. (A) Box plots comparing LYPD1 (top), PRSS23 (middle), and CDH6 (bottom) expression in CKD relative to LD, as in Table 1. Whiskers represent the upper and lower adjacent values. 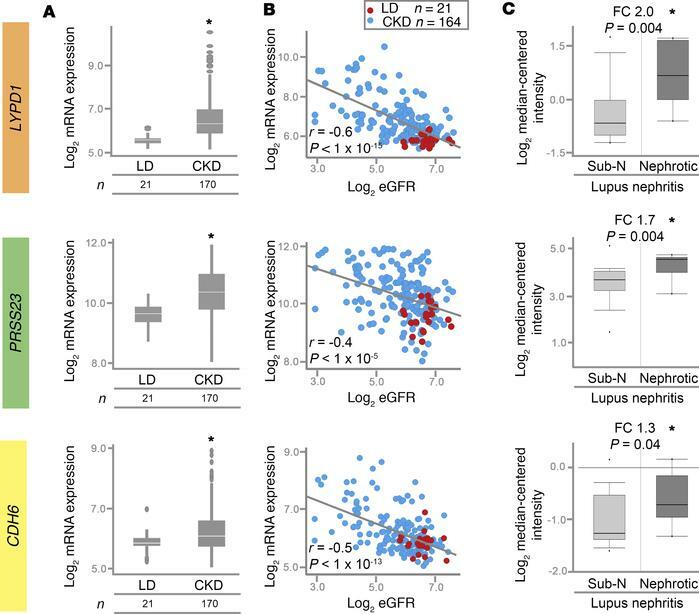 (B) Scatter plots showing gene expression from A relative to eGFR in CKD and LD. Statistical significance calculated using Pearson correlation. (C) Box plots as in A comparing individual gene expression levels to proteinuria groups in lupus nephritis samples from ERCB in Nephroseq (www.nephroseq.org). Subnephrotic (Sub-N), n = 18; nephrotic, n = 9. Statistical significance calculated using 1-tailed t test. Whiskers represent the 10th/90th percentile values as precomputed within Nephroseq. FC, fold change. *P < 0.05. See Supplemental Figure 4.